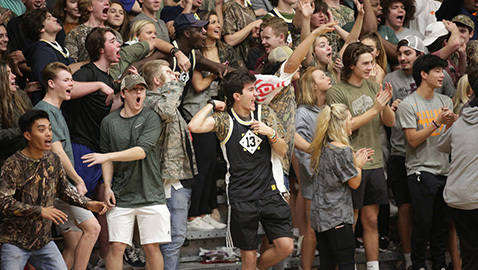 PHOTO BY LUTHER SIMMONS Bearden High's student section had a lot of fun watching the Bulldogs beat Maryville Feb. 5. The Dog House wasn't jammed pack, but it was nearly full, with an estimated 2,000 fans on hand to watch the rematch of the two Class AAA state powers. The closing of Knox County schools last week for “sick days” caused high school basketball games to be rescheduled or cancelled and also halted practice time. From an athletics standpoint, none of those things were good, particularly with post-season tournament time near. A Fulton versus Bearden game would have attracted a big crowd, too. The District 4-AA tournament, which includes Fulton and Austin-East, is slated to start this coming Friday at Alcoa. The Falcons will play the winner of Scott versus Kingston Saturday night at 8:30. Regular season play is scheduled to resume beginning tonight (Feb. 11) for teams in the Knox County school system, said KCS Athletics Specialist Marion Quinn Friday. One key matchup with championship and seeding implications has Bearden’s boys and girls playing at Farragut. Meanwhile, Karns Coach Lee Henson on Friday said: “We didn’t get a chance to play any games this week and have had to move our senior game to Monday. The delay will test the mental toughness of our team. The District 3-AAA tournament at Karns was pushed back one day and will begin with girls’ games on Tuesday and boys’ games on Wednesday. Other district tourneys will be played at William Blount (4-AAA) and Gatlinburg-Pittman (3-AA). BACK HOME: Holly Warlick, Tennessee Lady Vols head basketball coach and a 1975 Bearden High grad, was spotted in the stands watching last week’s Bearden vs. Maryville girls game. On the Wall of Fame outside the BHS gym is a framed high school photo of Warlick and her prep accomplishments, which included being the state champion in the 440 dash and scoring over 1,000 career points in basketball. HOOP HONORS: Three Knox County players have been selected Mr. & Miss Basketball finalists in Tennessee. They are Ques Glover of Bearden in Division I Class AAA boys, Grant Ledford of Grace Christian Academy in Division II Class A boys and Casey Collier of Webb School in Division II Class A girls. TIME TO START: Today (Feb. 11) is the first practice date for baseball, softball, soccer, tennis and track. RED DEVILS FALL: Halls’ wrestling team made it to the TSSAA state dual tournament this season but lost to Bradley Central 50-26 in the opening round at the Williamson County Ag Expo Center. Halls also lost to Independence 46-29 in the first round of the consolation bracket. The state individual championships will be held Feb. 14-16. MEET RUBY: There’s a new addition to the Bearden Bulldogs’ family and Coach Jeremy Parrott’s household. Her name is Ruby, a 13-week-old puppy that’s part French Bulldog and part Boston Terrier. “She was a Christmas present for our boys, Drew and Paxton,” said Heather, Coach Parrott’s wife, last week after the Bulldogs’ win over Maryville. Ruby was celebrating in the coaches’ office by playing with a tennis ball.